Rank: #7 out of 112. Power-elevating seat raises 10 inches - even while the chair is in motion! Battery Charge Distance: 15.29 miles -- Weight capacity: 300 lbs. Elevates 10" in just 16 seconds, even while in motion! Mid-wheel drive provides an excellent turning radius of just 22.5" for optimum maneuverability, even in tight spaces. Pride Jazzy Air is a very popular option at the top of the price range. 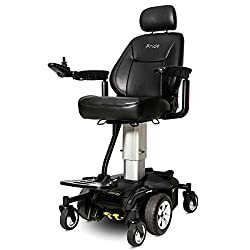 It's in the top 3 bestselling wheelchairs and has dozens of popular alternatives in the same price range, such as Pride Mobility Jazzy Air or Jazzy 614 HD . Pride Jazzy Air is $1334 more expensive than the average wheelchair ($2465).